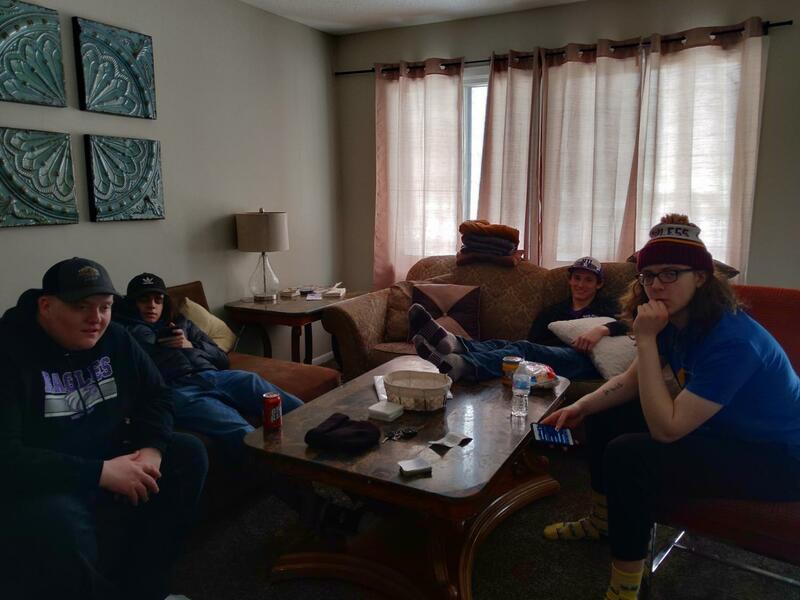 Seniors Travis Hulke, John Swift, Wyatt Roberts, and Augie Babel chilling in their Airbnb. Travel tips from NUHS students. Recently, the New Ulm High School boys hockey team went to state. The team played their first game at 6:00 P.M. on Wednesday night and from there they would either play on Thursday or Friday depending on if they win or lose. For many older students the state hockey tournament can turn into almost a week long event. The whole tournament runs from Wednesday to Saturday and is some of the most competitive hockey in the country. New Ulm High School provided a fan bus for students to get to the game on Wednesday, but this can be a great time for students to venture up there on their own and find a place to stay to watch the tournament. The first thing you need is a place to stay. Most people stay in hotels, but we chose to stay in an Airbnb. An Airbnb is a private rental between a renter and a customer for a short period of time. You use the Airbnb app to make a rental. We used it it because we didn’t want to stay in busy downtown and because we had 6 people. It came out to $420 for 2 nights in a 6 bed duplex. Our rental was a couple minutes from the Xcel Energy Center where many of the games were played. We then needed food and other necessities to last throughout our stay. We went to Cashwise under the advisory of Wyatt Roberts. We bought food and beverages for the morning: eggs and milk, as well as food for dinner and throughout the day, which included hot pockets and pizza. On top of that we also stocked up on various kinds of soda. In total all of the food cost us around $70. It is a good idea to carpool as much you can. We took two vehicles up to the cities with three people in each. Our Airbnb check in was delayed until 3pm so we decided to stop at Mystic Casino on our way up. We gambled it up for a while and headed on our way. Casinos are very empty on Wednesdays at noon. From there we went to the Airbnb. Once we got within the general area of the Airbnb, we received a message over the app which explained the check-in process. We had plenty of parking around the Airbnb, including a driveway and many other spots on the side streets. In the check-in instructions we received a code to an electronic keypad which unlocked the front door to our two-day home. Entering the home, we were met with a chalkboard which read “Welcome Home,” a binder with food recommendations, and a basket full of pop tarts and other snacks. 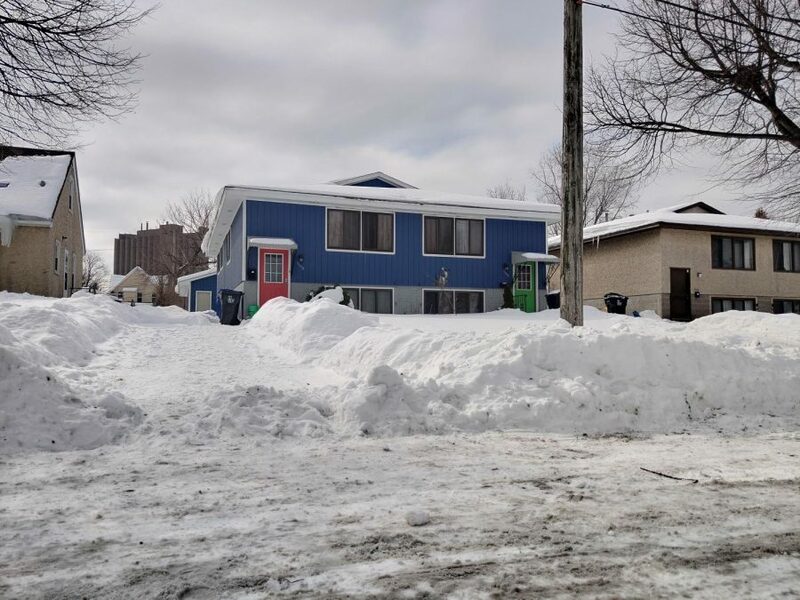 The house itself was a split-level duplex which sat in the suburbs of St. Paul near Hamline University, only a few miles away from the Xcel Energy Center. When entering the house there were two small staircases, one that led to the first floor, which was at basement level, and one that led to the second floor. On the first floor there were 4 different rooms including a bathroom. The other three rooms contained beds, one room with 3 beds, one room with one bed, and the final room contained a futon. The second level ended up being where we spent most of our time. On the second floor there were two more bedrooms each containing a bed, a bathroom, a kitchen, and a living room area which contained a coffee table, a 55” TV, and a few couches. We took Uber’s most places when we had to travel. Uber is an app that allows you to “ hail a cab” to wherever you are. You put your card information in the app and all the money is handled electronically. The cost of an Uber ride depends on distance, how busy it is, the area, and the availability of other Uber’s. A typical 10 minute ride for all 6 of us cost about $20. There were multiple different reasons that we decided to go with an Airbnb over a hotel. One reason was that the price for an Airbnb actually ended up being cheaper than if we got two hotel rooms because the Airbnb was $210 and a hotel room was around $170 a night and we would have had to get two rooms for two nights. Another reason we decided to go with an Airbnb was that with an Airbnb everyone could get their own bed. There was also more room for us to move around the house compared to a hotel room in which we would have been crammed in a smaller space. Everyone paid for different things throughout the trip which led to a lot of splitting of costs and paying people back. We switched up who put what costs on whose card. To pay everyone back everyone had to keep track of what they paid for and then split the cost 6 ways so everyone was paying for an even amount. This was an easy way to pay for everything compared to trying to split every cost up six ways on the spot.